My advisor Anne Walsh lent me her copy of Alison Bechdel‘s Fun Home, a graphic novel/memoir that came out last year. I’ve had it for some weeks now, but only just sat down to read it in earnest this weekend. I got up this morning, made my coffee, and decided to get back into bed and start reading a little of it again. I couldn’t get up until I’d finished the whole thing. It’s absolutely marvelous: one of the most satisfying reads of any sort that I’ve encountered in a really, really long time. 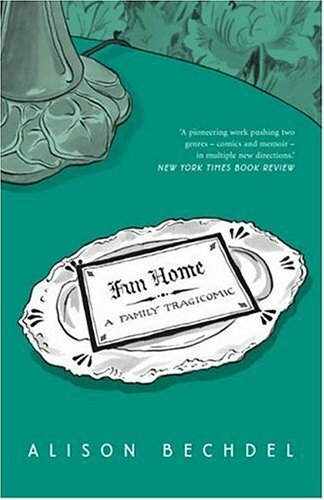 Having not even heard of it until Anne lent it to me (she left it in my UC mailbox, with nothing more than a post-it on the cover, saying “I love this book.”), I had no idea what a phenomenon Fun Home was: it was one of the runaway successes of 2006, hitting best-seller lists and winning awards. Since I’ve basically just finished it a few minutes ago, I’m in no position to offer anything resembling objective analysis or critical feedback: I’m just basking in the afterglow of a great, great book. Go get a copy. It’s amazing. You are currently browsing the Wofflings weblog archives for the day Sunday, April 15th, 2007.